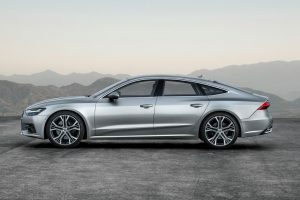 Audi has finally taken the covers off the new Audi A7 Sportback. Set to go on sale early next year, the Porsche Panamera rival features a sharp new exterior look, a raft of new technology inside, and a mild hybrid system on every engine in the range. The 2018 A7 Sportback follows on from the new Audi A8 by adopting Audi’s latest ‘MLB Evo’ platform. At 4,969mm it’s actually slightly shorter than the outgoing model, but is a nearly identical width and height. The wheelbase is 10mm longer, but Audi has squeezed 21mm more length out of the cabin to improve passenger space. The design is a familiar evolution of the previous A7 Sportback, but there are a number of detail changes evident. The front-end borrows heavily from the new A8, but the grille is wider and lower, and the headlights are narrower. Three headlight systems are offered, with the flagship Matrix LED system using Audi’s laser light tech. While the side profile and plunging roofline translate over largely unchanged, the rear now boasts a full-width LED tail-light. Audi promises it produces “fast-moving light animations” when the doors are unlocked. The rear spoiler, which rises at speeds of over 75mph, is retained, while eight new colours complete the redesign. An optional S-line styling pack brings a gloss black grille, plus sportier gloss black front and rear diffusers and sills. 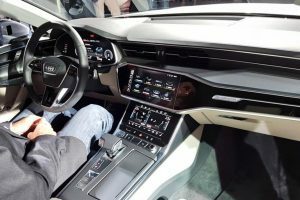 A great deal more A8 influence is apparent inside, as the A7 borrows Audi’s most advanced MMI Touch Response infotainment system. Two screens control the majority of the car’s functions, with a 10.1-inch upper display controlling the infotainment and navigation, and an 8.6-inch unit below for the car’s climate and comfort functions. Both screens use haptic and acoustic feedback to allow users to feel and hear a confirmation ‘click’ when a button is pressed. You’ll have to pay extra for sat-nav on base cars, however. Personal user profiles can be created with up to 400 different parameters, while there’s now increased ‘Car-to-X’ hazard information tech that can communicate with other Audis. 39 driver assistance systems are available, including the addition of smartphone-operated autonomous remote parking later in 2018. The cabin itself debuts what Audi calls a “futuristic lounge atmosphere”, designed to create a feeling of airiness and space. More headroom is promised in the rear, although the 535-litre boot is identical to before. 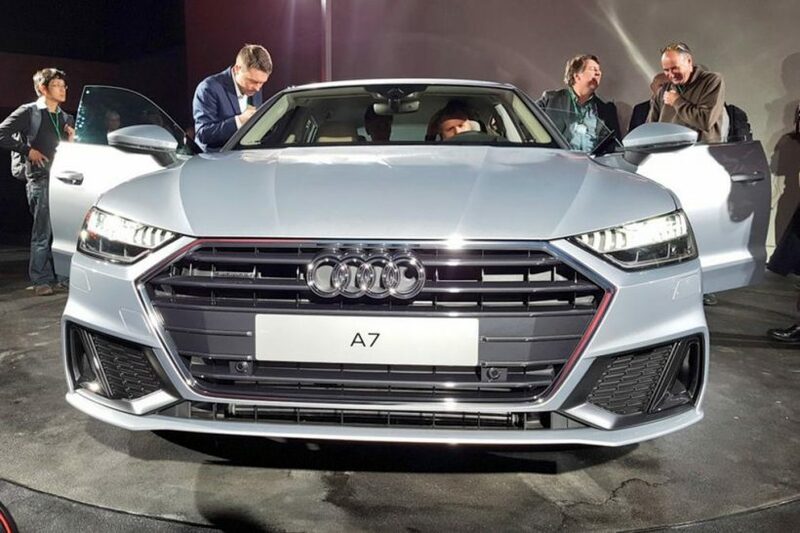 The new A7 debuts in Germany initially with one engine choice: a 3.0-litre V6 TFSI petrol unit – badged 55 TFSI under Audi’s new naming strategy – producing 335bhp and 500Nm of torque. That translates to a 0-62mph time of 5.3 seconds and a top speed of 155mph, while it claims 41mpg combined and emits 154g/km of CO2. Other four and six cylinder petrol and diesel engines will arrive later, although it’s not clear yet which units will come to the UK first. 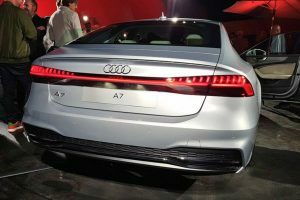 All engines fitted to the A7 will use some form of hybrid tech, with the six-cylinders using a 48v hybrid system. Regenerative braking feeds a lithium ion battery and a starter generator, allowing the car to coast with the engine off whenever practical between 34 and 99mph. Stop-start now activates below 14mph, and automatically starts the car when traffic moves away. The tech improves fuel consumption by around 10 per cent. • Why not check out our post about Drones, Robots and Mercedes? All A7 Sportbacks are rear wheel drive, with the optional Quattro system sending power to the fronts when required. Four-wheel steering is also available to boost agility, while a new electronic chassis control system debuts. Buyers get four suspension setups to choose from: standard steel springs, sports suspension lowered by 10mm, an adaptive damper system or self-levelling air suspension. A rear limited-slip differential can also be specified. UK pricing details for the A7 Sportback are yet to be revealed, but we do know that the 55 TFSI Quattro will launch at 67,800 euros (£61,000) in Germany in February.